It had to happen! Due to popular demand, we are releasing the next chapter of the Bag Oâ€™ Zombies!!! series a little early. The new Zombies!!! 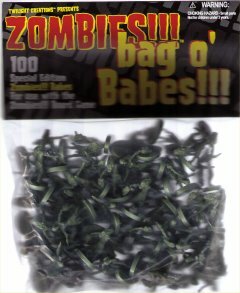 : Bag Oâ€™ Babes features 100 of the newest female zombie figures featured in the new Zombies!!! 2nd Edition. But this one has itâ€™s own header card! Other products in the "Zombies" series.